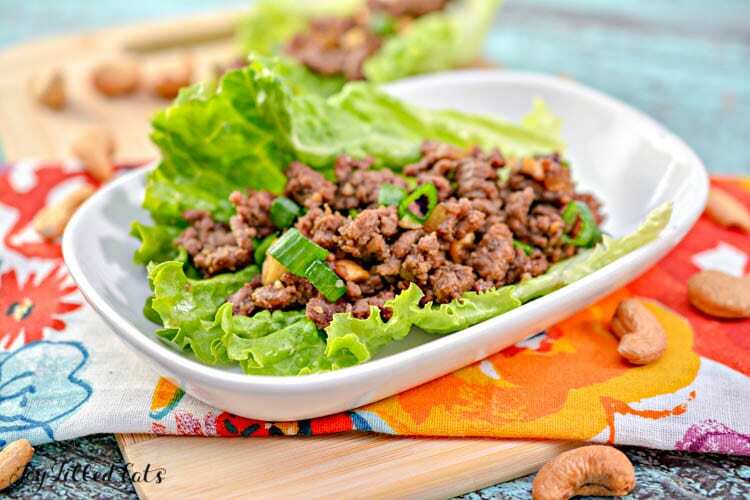 Perfectly seasoned ground beef, wrapped in a crunchy lettuce leaf these Asian Lettuce Wraps with Beef are the light meal that you want to enjoy as we enter the warmer months. I decided to enlist the help of my husband to write up this post because beef is more of his choice meat than mine. He loves my Java London Broil Recipe for the Grill and my Beef and Broccoli Recipe. But then he puts a line in like this, “Whenever I travel, I look forward to trying the different flavors of food and spices native to where I am. 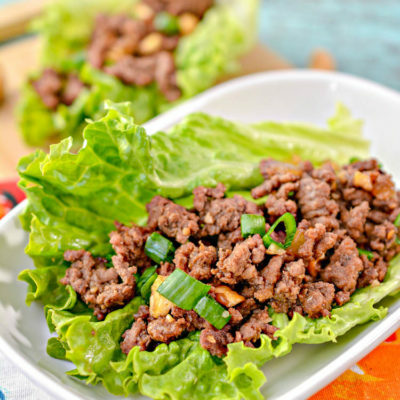 These beef lettuce wraps take me right back to the open food market in South Korea”. We’ve never been to South Korea. And I’ll be surprised if we ever do go. We have five kids and, although someday we will be empty nesters with the possibility of traveling, he hates to fly. And South Korea is on the other side of the world from New Jersey. Let’s stick to real life, honey. What type of lettuce for lettuce wraps? 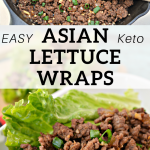 A common question that I hear is “what is the best lettuce for lettuce wraps”. I personally enjoy butter lettuce or iceberg, it gives you a larger wrap to hold all your ingredients as you eat. The firm spine on lettuce like romaine makes it more difficult to roll up your lettuce wrap. Step 1: Saute the onion. Of course, we are talking about the beef lettuce wraps. Always dressed! A tip is to drizzle the sauce on top last after your wrap is filled. This helps to reduce the amount of sauce and juice that will drip out of the lettuce wrap and trickle down your chin. But I recommend having a napkin ready just in case. Step 2: Brown the ground beef. In our house, my husband is the only one that appreciates a seriously spicy meal. I typically lean to the mild side when I cook for the family, but I will provide some extra Asian hot sauce on the side that he can add if he wants to crank up the heat a little more. Step 3: Add soy sauce, seasonings, and then the cashews. Can I Use Chicken in these Asian Lettuce Wraps? What about Ground Turkey? Or Pork? Absolutely! Feel free to switch out the beef for your meat of choice. You can even make these vegetarian by swapping in some mild chopped vegetables such as zucchini. 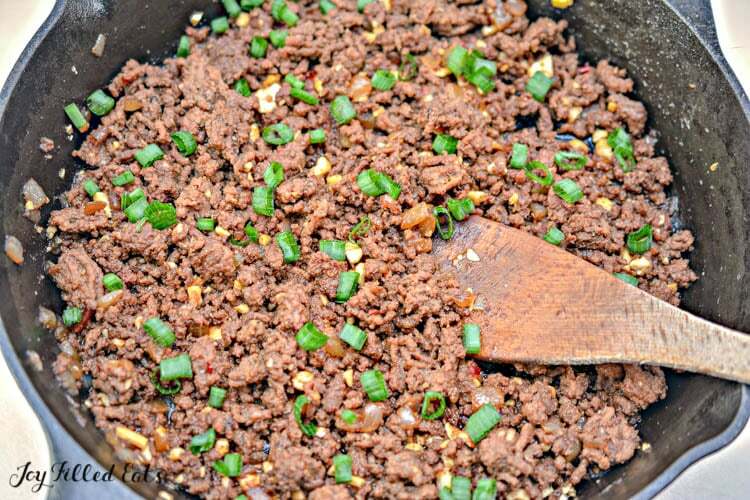 The Ground Beef for the Asian Lettuce Wraps Ready to Serve! 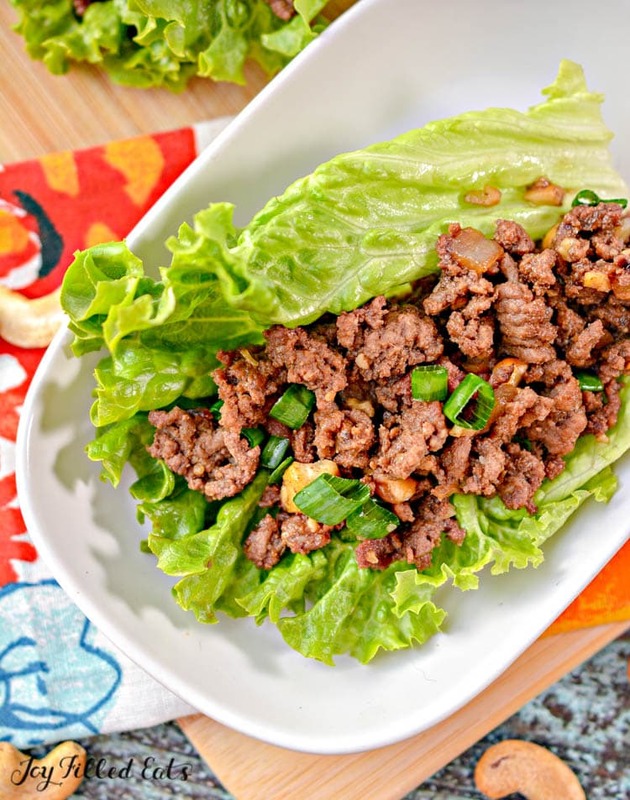 If you are throwing a party or entertaining, lettuce wraps fit every diet. Besides being low carb and keto, they are delicious. Just provide some choices of sauces and dressing and your gluten-free friends can stay true to their lifestyle. Let everyone build their own wraps. You can provide different proteins, different toppings as well as the different seasonings. There is something about “build your own” that we all love. I hope you enjoy Asian Lettuce Wraps with Beef & Cashews as much as I do. It is a great healthy and delicious meal that I am sure you and your family will love. 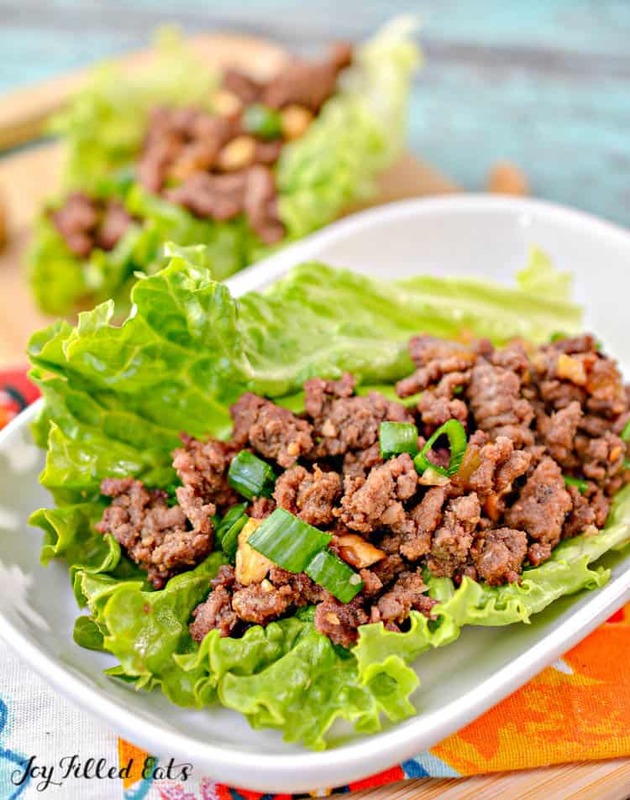 Perfectly seasoned ground beef, wrapped in crunchy lettuce these Asian Lettuce Wraps with Beef are the light meal that you want to enjoy again and again. Heat up ½ tbsp of sesame oil in a skillet over medium-high heat. 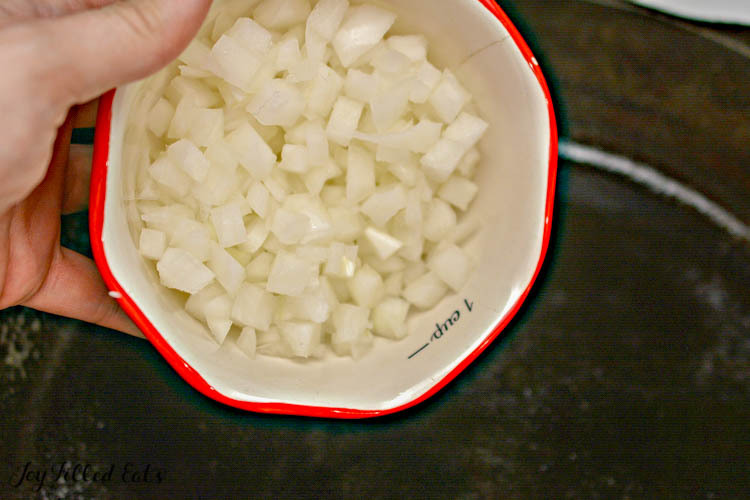 Add the chopped onion to the heated skillet, and cook until softened and starting to brown. 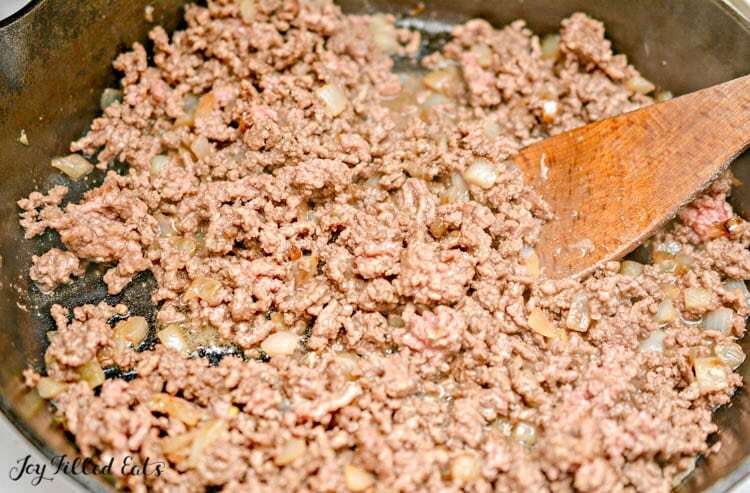 Mix in the ground beef, and cook until the beef is completely browned. Stir in the soy sauce, Swerve brown sugar substitute, chili garlic sauce, ginger paste, and minced garlic. Stir to combine well. Continue to cook down the mixture, lowering the heat to medium until most of the liquid has been absorbed. 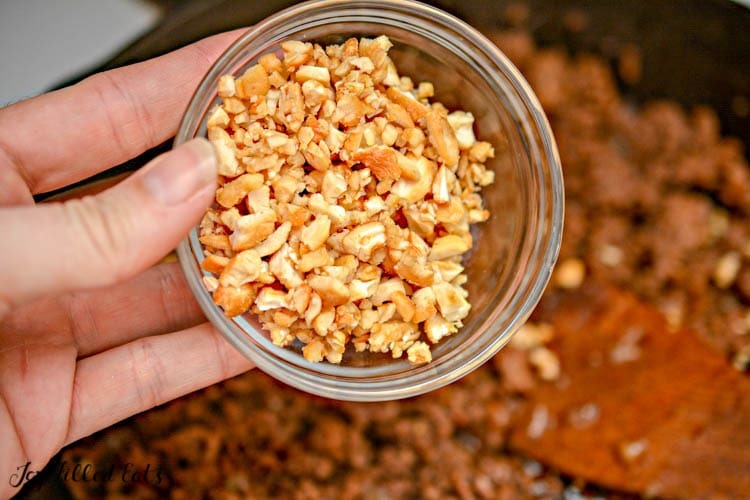 Mix in the chopped cashews, and remove the skillet from the heat. Let the mixture cool for a few minutes, and then add spoonfuls of the beef mixture to the green leaf lettuce cups, and top with freshly chopped green onions before serving. If you would like to make your own brown sugar substitute you can simply add a drop of molasses to 2 tablespoons of Trim Healthy Mama Gentle Sweet, Truvia, or my homemade blend of xylitol, erythritol, and stevia. I love that you can switch out the protein in this recipe. I was skeptical about the cashews in the meat, I normally use them as garnish, but it WORKED! Great addition . We had this for dinner last night and my whole family loved it! !